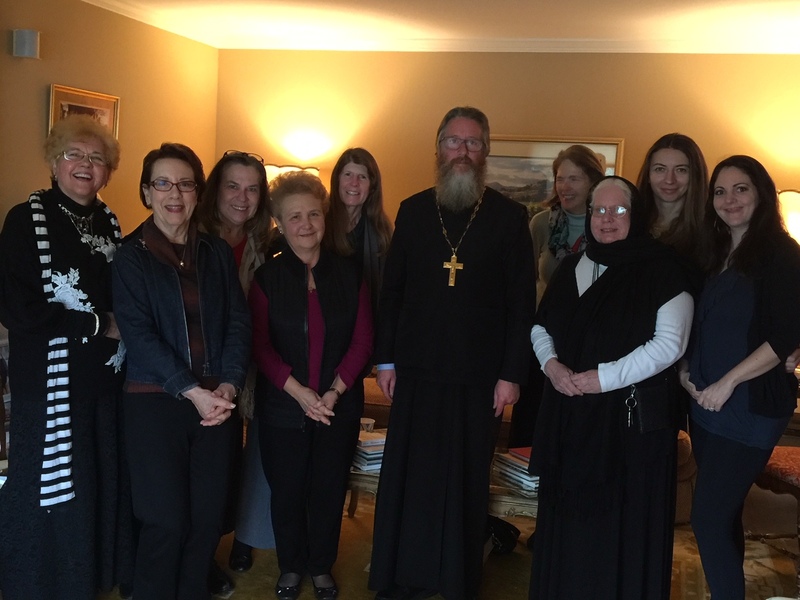 On Saturday, March 17th, at the home of Thalia Welch, we held our Ladies Lenten Retreat. The topic of our discussions was the book "God's Path To Sanity" by Dee Pennock. Below are the notes from Fr Martin's talk highlighting certain points from the book. 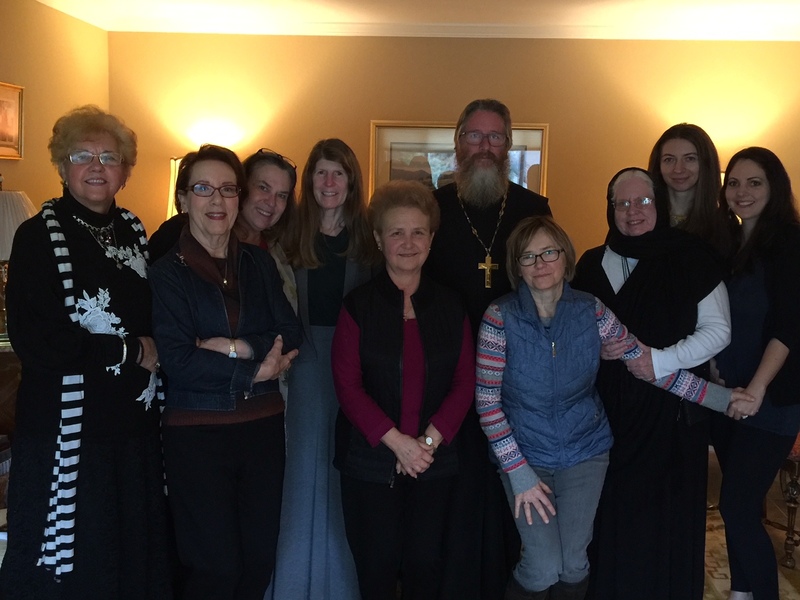 We had a wonderful time together and hope to continue this as an annual event where the women of the parish can get together for fellowship, edification, and enjoying each other's company. Point #1 – The nature that we were born with, our fallen human nature that we inherited as fallen human beings, is NOT the nature for which we are created, the image of Christ. Our nature… that which we were born with – fallen and in need of healing; and that which were created with – in the image of Christ. We must neither ‘give up’ nor make excuses for our sins because ‘that is human nature’. We were created for much more! With man this is impossible, but with God, all things are possible. We have the example of the saints… who were perfected in the image of Christ. We know salvation is possible by virtue of the sanctity of their lives. So, understanding this distinction of what we are in our fallen state vs. what we are created and intended to be is very important for the proper approach to the spiritual life. Point #2 – The holy fathers make a distinction between the lower aspects of the soul and the higher aspects of the spirit. “A man has three layers of life: that of the spirit, of the soul, and of the body. Each of these has its sum of needs, natural and proper to a man. These needs are not all of equal value, but some are higher and others lower; and the balanced satisfaction of them gives a man peace. Spiritual needs are the highest of all, and when they are satisfied, then there is peace even if the others are not satisfied; but when spiritual needs are not satisfied, then even if the others are satisfied abundantly, there is no peace. Therefore, the satisfaction of them is called the one thing needful. The distinction made here between “soul” and “spirit” does not mean that these are separate entities within human nature; rather, the “spirit” is the higher part, the “soul” the lower part, of the single invisible part of man (which as a whole is usually called the “soul”). To the “soul” in this sense belong those ideas and feelings which are not occupied directly with spiritual life-most of human art, knowledge, and culture; while to the “spirit” belong man’s strivings towards God through prayer, sacred art, and obedience to God’s law. So often, spiritual life remains relegated to the aspects of the soul. It is important for us to examine this – both in order to understand and elevate the soul, but also to recognize the higher aspects of the spirit. Fr Seraphim Rose spent a good deal of time in his catechism of young people discussing the need to develop the formation of the soul. Modern man has been so impoverished that we have some work to do just to familiarize ourselves with the awakening of the recognition and appreciation for the good, the beautiful, and what used to be ‘normal’ responses of human empathy and compassion. Point #3 - The three aspects of the soul: thinking, feeling, desiring or mind, heart, gut. Defining these specific aspects of the soul is extremely helpful in better understanding our spiritual make-up and therefore being able to more accurately diagnose where we are falling into sin. We must raise our mind, warm our heart, tame our will. The passion that attacks the mind or thinking aspect is pride. It blinds us to reality and puffs us up with an over-inflated sense of our independence, need for control, and need to be right. The passion that attacks the heart or feeling aspect is self-love. It enflames us with a desire for the fool’s gold of carnal satisfactions (gluttony, lusts, pampering, etc.) lulling us to settle for or attempt to satisfy ourselves with earthly consolations. The passion that attacks the gut or desiring aspect is vainglory. It seeks out admiration and attention from others and leads us in the futile pursuit of people-pleasing. Analogy of the ‘umbrellas’... God’s love is unchanging. His love shines down upon us consistently. It is WE who hide ourselves in the shadows of our sins. Each time we sin it is like we open up an umbrella that obstructs the light of the sun. Sometimes those umbrellas are little cocktail umbrellas and sometimes they are huge parasols. But each one creates and obstacle between us and the shining love of God. Repentance and confession allows us to knock down those umbrellas and once again be able to perceive and receive the light of Christ. Point #4 - How do we turn around the passions that affect our thinking, feeling, and desiring aspects? If pride is rooted in ignorance of ourselves and our need for God, then we pray and work toward true self-knowledge and an awareness of God and our relationship to Him. We must feed our mind with holy things (scripture, contemplation of God, prayer, lives and writings of saints, etc.). Things which inspire us and build us in truth and FAITH. Our vain-glory is fed by self-justification, blaming, hiding from facing the reality of our state. Making excuses for our sins… How quick we are to do so and how hesitant we are to make excuses for the sins of others. This should be completely reversed! We focus on the sins of others – it is THEY who are annoying, rather than looking at our self and working on why we are being annoyed. Things which inspire us toward humility and build in us HOPE. Our self-love is fed by pitying ourselves, by trusting in our abilities, and – when they are frustrated – by seeking comfort in sensual pleasures to get a quick fix. Self importance and willfulness are the main causes of our anger, irritation, frustration, depression, etc. We are looking for love in all the wrong places… St Augustine said: ‘Man is restless until he finds his rest in God.’ Things which inspire us toward true LOVE of God. If our spiritual condition is dependent upon the ups and downs of life, we are in for trouble… because you can count on life to be filled with ups and downs. So much of the spiritual life is paradoxical… Our Lord tells us that he who loses his life for Christ’s sake will find it. It is when we jealously and fearfully cling to our self importance and our willfulness that we lose out. Bob Dylan sang: ‘When you ain’t got nothing, you got nothing to lose.’ It is not that we must literally lose everything, but we must indeed lose our attachment and misplaced hope in things. It is a matter of the disposition of the heart. Where is our focus? If our focus is constantly on our self – our needs, our will, our desires – then we are in for a world of trouble and frustration. If the center of our focus shifts away from our self, toward the proper priority of God, then others, then our self… then we better align ourselves with the will of God and we can find peace and joy. Too much dramatization of our lives is an indication of self-love. The compass and the map. We often get so bogged down in the details of the map that we lose sight of the compass. We must have our sights set higher… upon God and upon eternity (which begins now). And this is where that highest aspect of our being comes into play. We spoke at the beginning of mankind being composed of body, soul, and spirit. And we have just dissected the soul into its three main components: thinking, feeling, and desiring. Now, what of this higher aspect of the human being: the spirit. St Theophan the Recluse defines the spirit as that force which God breathed into man when He created Him. It comes from God, knows God, seeks God, and in Him alone finds rest. St Theophan further goes on to define three movements in the life of the spirit: the fear of God, the conscience, and the longing for God. The spirit acts upon the lower elements of the soul… In the thinking part by inspiring the yearning for the ideal. In the desiring part by inspiring the yearning for and production of good deeds. In the feeling part by inspiring the yearning for the beautiful. Understanding this patristic teaching of the nature of human beings helps us to understand ourselves better. It allows us to better perceive the temptations which beset us and where they are attempting to take hold in us. Point #6 - Understanding the true dignity of who we are helps us to raise ourselves up above the carnal and mundane and tune in to the true measure of who we are created to be. The opposite of self-love is NOT self-loathing. This kind of disproportionate beating up of oneself is the other side of the same coin of self-preoccupation. It still remains me, me, me. A sober and healthy sense of the worth of our human person, that Christ values us enough to have suffered and died to redeem us, this kind of vision of the image of God within us is necessary in order to distinguish the unhealthy and sick tarnish and soot that besmirches the icon of Christ within us from the beauty of that icon. We must mercilessly persecute and work to eradicate and clean up that dirt and soot that defiles the beauty of the image of God, while never confusing the sickness of our sin from who we really are created to be.